It's August and Anne is back in New York City for the summer, but she can't escape the memories of the terrible things that happened at the Wheatley School last spring-- and the possibility of being expelled looming over her. When an unexpected-- and suspicious-- turn of events gets Anne sent back to Wheatley, she's determined to figure out what happened to her favorite teacher and only adult ally at the school: Ms. Cross. After a shocking, gruesome murder with connections to the Wheatley School occurs, Anne is convinced there's more to Ms. Cross's sudden disappearance, and that her favorite teacher is in danger. But after an ugly breakup with Brent and a new, inexplicable distance between her and Anthony, Anne isn't sure who she can trust. And even worse, Anne discovers evidence that someone at Wheatley is covering up what really happened to Ms. Cross-- someone who will stop at nothing to keep Anne from learning the truth in this engrossing, unputdownable read. 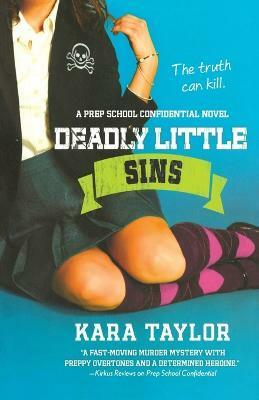 KARA TAYLOR is the twenty-something author of the Prep School Confidential novels. Recently, she developed a TV show with Rashida Jones and Will McCormack (cowriters on Celeste and Jesse Forever) which was bought by the CW. In the past, Taylor has worked as everything from a nanny to an ice cream scooper on Fire Island, New York.